I started travelling using my own money on April 2008. Fresh grad and earning just enough from my online shop (Anagon Collection! ), I went to Bangkok to explore the city with my friend from high school. Ever since, there wasn't a year that I didn't go out of the city - whether abroad or within the country. I used to be very magastos with shopping, taxi rides, or hotels, but now I learned a lot on being practical and making good choices -- whether in my travels or in life (naks!). I saw a lot of these changes and shift of priorities during my recent trip to Singapore - Malaysia. I am not very high maintenance, and I don't have so much phobias so I can take a nice economy seat anytime. I'd rather spend the extra money during my travel than using it for a business class flight.. maybe next time when I earn more and can afford the luxury! Since we booked this trip barely a month before travel date, my travel buddy and blog best friend Paul and I got the tickets at P4759 / head from Manila to Singapore (inclusive of taxes + 20kg baggage allowance via Cebu Pacific). Going home, we took Air Asia at P3697 / head from Malaysia, also inclusive of taxes. Always be prepared! Printed tickets, hotel receipts, travel itinerary, etc. Aura muna at the beautiful Changi Airport, he he. Wearing almost all-Giordano + Sanuk. 2) Book Accommodations via Agoda. My favorite website for travel accommodations, Agoda offers reasonable rates for hotels and hostels compared to other sites. For budget travellers like me, choose hostels over hotels so you'll pay for more or less half of hotel room rates. Another cheap but cool travel accommodation I've tried before was via Airbnb (read my Japan post here). Price is a bit steeper compared to other Singapore hostels (USD50/night/head), I chose Wink Hostel at Chinatown because of its good location and quirky pod set-up. Something different from bunk beds of usual backpackers' inns, living in one of Wink Hostels' mini pods for 2 nights is a bucket list worthy experience! Key card system for both your locker and room. Locker is located at the bottom of each bed - roomy enough for a backpack or small luggage. Booked 2 pods for 2 nights for only USD 147.96! Published rate in their site is USD 50/head/night, so we already saved around USD 50! Coolness! Blue lights option at night! Price is already inclusive of breakfast of unlimited breads, assorted spreads, juice, milk, water, coffee, tea, hot chocolate, cereals, and fruits. Common toilet and shower area, separate for male and female. Tissue paper and hair dryer are available, but you have to bring your own shampoo, conditioner, body wash, tooth paste, etc. Laundry + ironing area also available, at extra cost. Since we were already in Singapore, it is practical to spend a day or 2 nadin in Malaysia para sulit. It was also my first time in Malaysia. Bus ride to Legoland Malaysia took us 1.5 hours only (which already included 2 immigrations stops), but from Legoland to Malaysia's city area (Kuala Lumpur / Genting High Lands) it took us more than 6 hours. Thanks to Pax's tip, we booked a cheap night bus via EasyBook.com from Johor Bahru going to Genting Highlands. We left at around 10pm, and arrived almost 5am. To be sure, book tickets in advance! Bus from Singapore (terminal is at SG Flyer) straight to Legoland is at Php 420 each only. PS: Lol at pa-bebe face. Hahaha! Night bus from Johor Jaya terminal (around 1 hour from Legoland via Taxi) costs around Php 750 each only. The bus is comfortable and roomy, I just slept during the whole ride. I spent an extra Php 1840 (per head) for a room in Awana Hotel Genting Highlands, na hindi naman namin nasulit because we arrived at around 6am already. Although it did gave us a few hours of comfortable sleep and shower time, plus we were able to avail the inclusive buffet breakfast... so pwede nadin. View from the balcony is also great! Next time though, I think it is more practical to stay in a cheaper hotel / hostel in KL. 4) Choose local cuisines over fancy restaurants. Back in Singapore, our meals were mostly from hawker street foods that are way cheaper, still clean, AND mas feel na feel pa namin na we're in Singapore! Staying in a hostel in Chinatown, mas maraming walking distance food choices in the area - and most of the meals cost less than SGD 10! SGD 1.20 ice cream sandwich at Orchard Road - a classic SG trip treat! 5) Commute! Choose public transportations over taxi! To get the real feel of a new country, take their bus, figure out their rail way station, and literally just get lost! Although in SG, it's not hard to navigate your next route because of their convenient SG MRT map app (download this during your trip!). We also availed the Singapore Tourist Pass card for unlimited MRT, LRT, and bus rides for 1 day at SGD 10 only (plus SGD 10 deposit). 6) Research for free things to do in the city! Sri Mariamman Temple, Chinatown - they charged us SGD3 for taking photos, but they also served free vegetarian food to the guests when we were there! Lucky. For 4 Days, 3 Nights in Singapore - Malaysia!!! I thought I'll be spending P50,000 for this trip, but by choosing better, I was able to cut-down the cost at almost 50%! Aside from traveling, I also make the most out of my everyday budget, including my phone bills. Sun Cellular recently gave us more reasons to switch networks and #ChooseBetter. 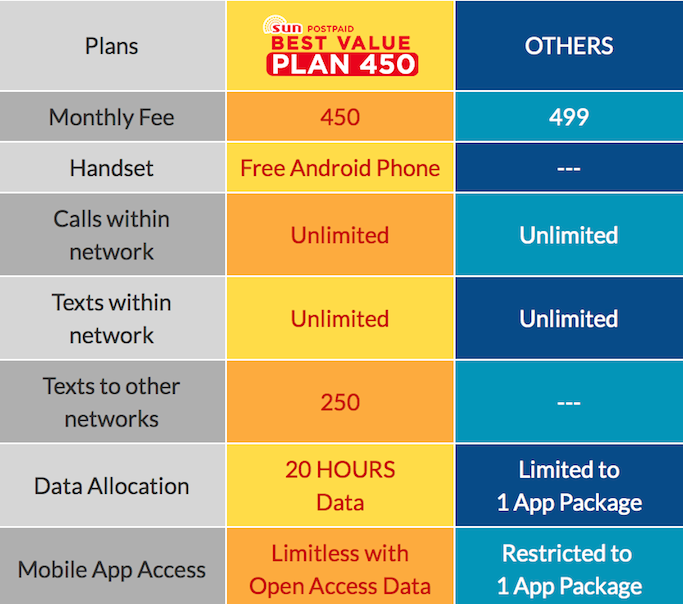 With SUN Post Paid Value Plan 450, you get unlimited SUN calls and texts, 250 free texts to other networks, 20 hours data, PLUS you also get a free Android Phone (Huawei Y600 or O+ 360 Alpha)! Definitely a better deal compared to my old prepaid network where I used to pay Php 1 per text, limited surfing, and no free phone! I think I used to spend Php 1500++ / month just to avail their unlimited text within same network, 10 minutes call, and unlimited internet. I've become more practical since I've been a SUN subscriber for almost a year, and saved money along the way. Pandagdag din yan sa pang travel! Hehe. 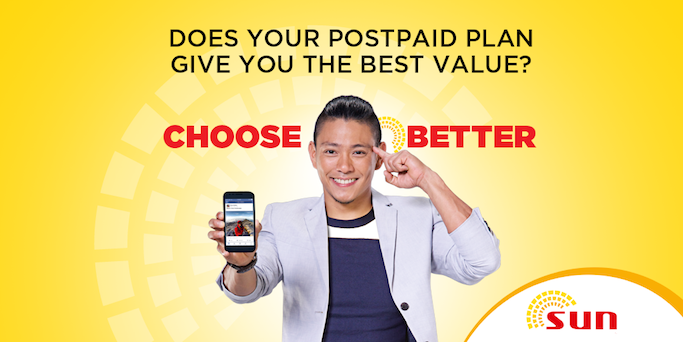 For more information on SUN Post Paid Value Plan 450, visit http://suncellular.com.ph/choosebetter. More SG-MY travel posts next! True!! I love hostels and local food stalls to truly experience a city. Nice post! hi, ate ana! (wow close) my friends and I are wandering... we also want sana to do your itinerary pero mejo naconfuse lang kami. so you left sg in the morning right? straight to legoland? the night bus you were referring to, from lego land to kuala lumpur na? Hi Ana! your blog makes me more excted to go to SG. Is it okay if I get your email address kase I have questions re sa SG itinerary? :( Thanks! Thank you! Feel free to email me at mail.anagon@yahoo.com :) Thanks a! Hi, what bus did you take from SG to Legoland? @Unknown: http://www.easybook.com - buses via Singapore Flyer (WTS Bus Line) which we booked online in advance. Nice blog! Aside from your itinerary and hotel bookings, what other documents did the immigration officer ask? like company id, income tax, etc. Any info would be appreciated. Thanks! Hi Ms. Ana:) is it possible ba na maikot namen ang marina bay sands, esplanade, helix bridge, singapore flyer, merlion park and gardens by the bay in 1 day? and where do you suggest na mag start? Hi Ms. Ana. It's possible po pala na from MNL - SG then ang pabalik is MALAYSIA - MNL na? Di po ba magka ka problema sa Immigration?